YIIK: A Postmodern RPG is ranked in the 20th percentile of games scored on OpenCritic. The experience might be muddied by a few rougher edges, like the consistently grating load times and some of the discomforting battle quirks, but more often than not, I came away impressed by how well everything came together in spite of some issues. The ambition and scope of this lengthy indie epic is impressive, taking big swings and, despite the numerous inspirations, carving its own distinct path. If you want your Japanese-style RPG to do to New Jersey what Shin Megami Tensei does to Tokyo, then YIIK is the closest you'll ever get. I can honestly say that YIIK: A Postmodern RPG is one of the most hands-on and unusual RPGs I’ve played in a while. There are a lot of QTEs within the game, almost every attack and literally every defence will require you to grab your controller and test those reflexes, but you get used to it after a while. The game may not be a ‘looker’ with its simplistic design, but it all adds to the charm. With its brilliant writing, equally as good voice acting, intuitive combat and progression system, and overall quirkiness – I can’t help but recommend this game to all RPG fans. YIIK: A Postmodern RPG is a dazzling explosion of stylistic presentation and compelling strangeness. This might go down as “EarthBound for a new generation,” and much like EarthBound, the quality is difficult to score, since it is based less on the precision of design and more on an intangible, heartfelt payoff. While some gamers may not see anything special going on here, YIIK will likely really resonate with some players. If a Weird Stuff RPG appeals to you, strap in and prepare for a wild ride. Surreal themes aside, if you're simply looking for an RPG experience on the Switch with far-out visuals, YIIK should satisfy your turn-based desires. Despite a few wonky issues with combat at times, YIIK: A Post-Modern RPG more than succeeds in delivering a fascinating and unique tale that isn't afraid to get bizarre and humorous while still making you sympathize with its cast and keeping you on the edge of your seat. YIIK has been a bit of a strange one for me. Whilst I enjoyed seeing the quirky story through to its conclusion and loved exploring the wonderfully crafted world, the repetitive battle system and poorly executed levelling up system left me feeling a little underwhelmed. Neither aspect was particularly game-breaking nor did they make YIIK end up feeling like a bad game, but they did stand out a lot as I made my way through the fairly lengthy adventure. It’s definitely going to be a divisive experience for gamers though and it certainly won’t tick enough boxes to warrant a purchase for everyone. For me though, YIIK did enough right to make it recommendable for fans of RPGs or those who like a truly surreal experience – it’s far from perfect, but it still manages to offer an enjoyably bizarre journey that I was glad to be a part of. YIIK is visually appealing, has a nice soundtrack and is pretty funny at times. But the battle system needs a little more polish and the main character was… not my cup of tea. 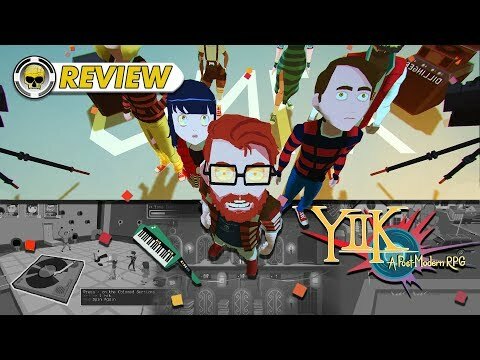 YIIK: A Postmodern RPG is huge achievement for Ackk Studios, it is so much better than their previous title, and maybe a little more attention to combat system and controls could’ve even made it one of the best indie titles in years. Nevertheless, A Postmodern RPG is a fun game that will probably worth your time and money. YIIK is a game that will capture the heart of anyone with an affinity for old-school RPGs and absurd, informed, dorky humour, but it'll take patience and perseverance to see it for what it really is. WORTH CONSIDERING - YIIK tries many new things to reinvent the JRPG genre only to fall flat. It’s a shame because there is a potentially good game buried under the pretentious main character, Alex. The music is great though! Rough design, a lack of polish, a discombobulated story, and hard-to-bear battles make it hard for me to recommend YIIK to anyone but the most fervent collector of 'odd' games. Save yourself the time, and replay the Mother/Earthbound games instead. YIIK: A Postmodern RPG tried to do something different on PS4 but just forgot to pack in the fun factor that someone expects when diving into a video game.